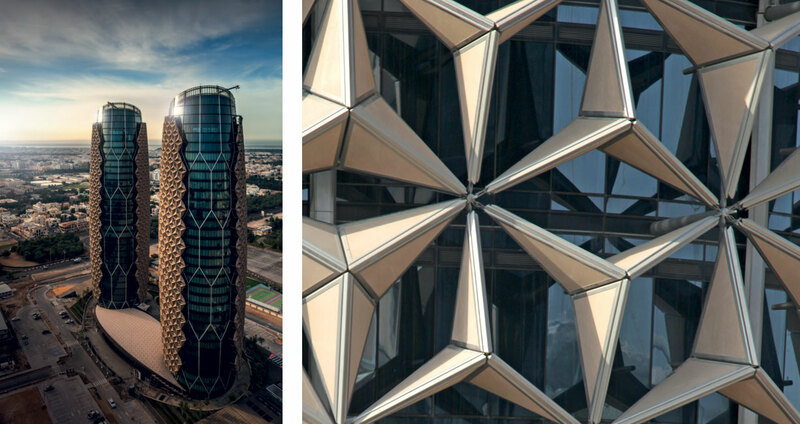 Al Bahr Towers is a prime example of Diar Consult’s collaboration and partnering with international designers that has led to not just successful but award-winning architecture. In 2009, Aedas UK appointed Diar Consult as associate architects to provide services as architect of record and engineer of record responsible for all contract administration, post-contract supervision, design review, code compliance and licensing on Abu Dhabi Investment Council and Al Hilal Bank’s new headquarters. Aedas had secured the project through an international design competition in 2007, by presenting an “inventive, sophisticated, thoughtful and bold” proposal. 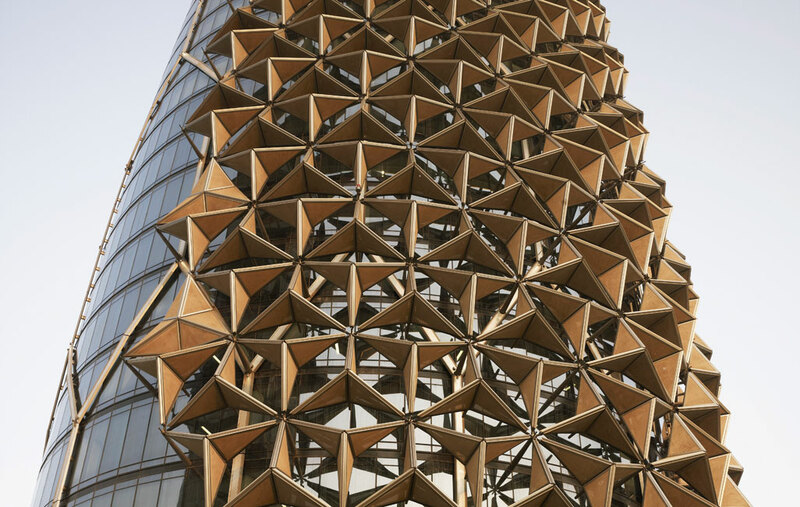 The building is aesthetically defined by the world’s largest computerised dynamic facade; a reinterpretation of the traditional Arabian mashrabiya in the form of 2098 adaptive “flowers” that open and close in response to sunlight. This protective skin wraps the east, south and west facing elevations, reducing solar gain by as much as 50% and subsequently reducing air-conditioning load. The adaptive shading also allows for clearer glazing to be used, with the effect of improved visual permeability and greater daylight penetration, resulting in less reliance on artificial light. These factors helped the project to achieve a LEED Silver certification for sustainability. Reference to regional traditions is further reinforced by the geometry of the plan form of the towers; derived from three intersecting circles, connected by three tangential arcs. The circle is traditionally used to reflect the notion of unification and the unity observed in nature. Innovation was not limited to the design and construction of the building. 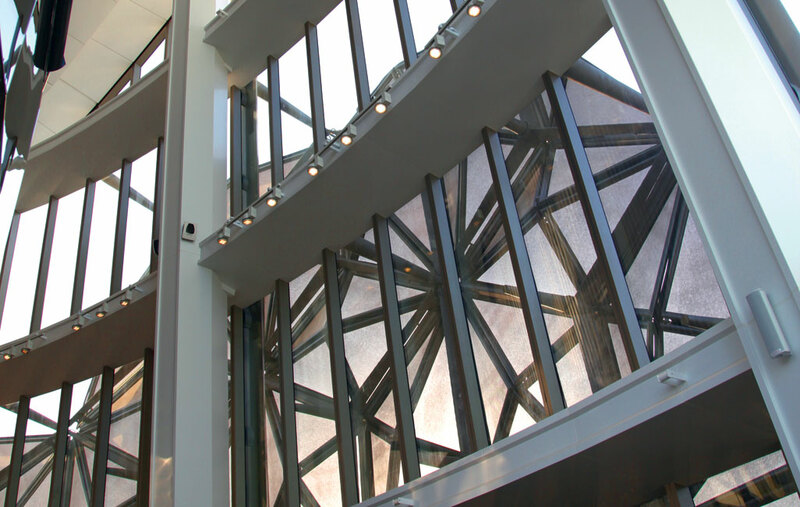 The design process benefited from the development of bespoke software used to generate simulations and analyse the performance of building elements. This in turn opened up new ways of communicating information through the project team in a more effective manner than previously available. 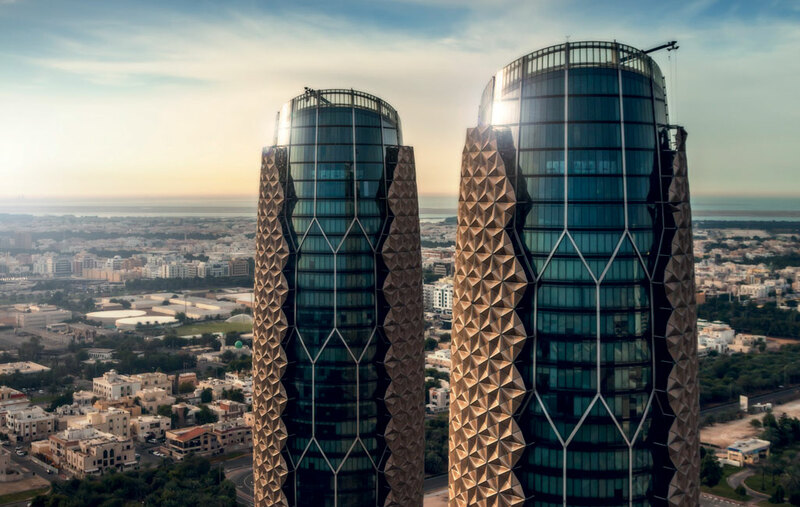 The successful completion of Al Bahr Towers is testament to a remarkable and coordinated global effort by an international team, sharing expertise and resources, embracing new technologies and hitherto unexplored innovative forms and techniques of construction. The result is one of the most unique and remarkable developments in the Middle East, if not in the world – a project built by a local contractor, with a supply chain and manufacturing sources from Europe, China and the Middle East.